While pet cremation jewelry or glass balls containing a loved one's cremains are popular, there are those who just don't feel right about separating the ashes. This is a wonderful alternative to that. 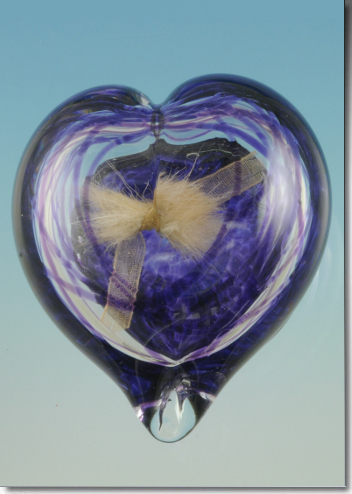 The Encased Memories heart was created to permanently preserve a cherished momento. Made of glass, the heart is created with a specific opening size at the bottom. Once the keepsake(s) is/are received by the artist, it is placed in the hollow chamber of the glass sculpture and then the chamber is filled and sealed closed with a special U.V. light-activated epoxy preserving it forever. As photographed, you can preserve your pet's fur but we would suggest also adding (if small enough) a small tag, or a piece of their collar along with the fur or even some special dried flowers. Your possibilities are endless, but you do have to consider with opening size. Size: Heart is 4.5" High and the opening is 1 1/2" wide.